I have awakened from my long blogging slumber! 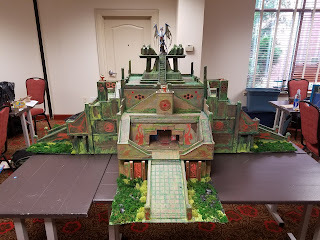 This past weekend was Ultracon 6, our friends and family convention. 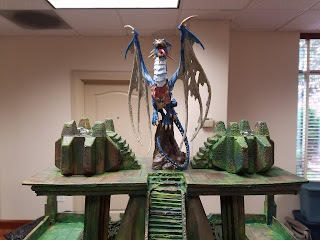 The theme for this year was a sunken city named Draconis, which had risen for various campaign reasons. We had fifteen players, in three groups of five playing the adventure. The player characters were submerged the entire day Saturday, which made for some interesting three-dimensional combat. To make the latter work better we created water stands that would slide up and down a dowel. After some quick measurements from a ruler, you were swimming up and down in no time! 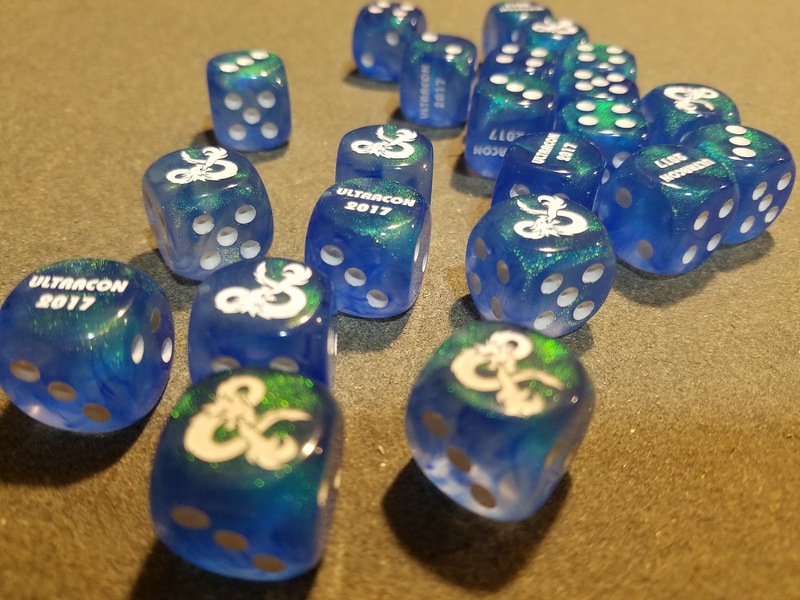 Our water stands in use for 3D combat! Their enemies included Deep Ones, Mind Flayers, Aboleth, and an Elder Brain. But the big battle would be at the Great Ziggurat at the center of the city. There Nethyrmaul the Undying, the ancient dracolich, would be waiting for them. 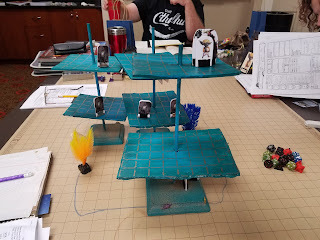 We designed the encounter so Nethyrmaul took turns attacking a different group each round. All the while the PCs had to deal with an army of ghouls, stone guards, paralyzing traps, and caustic water spouts. 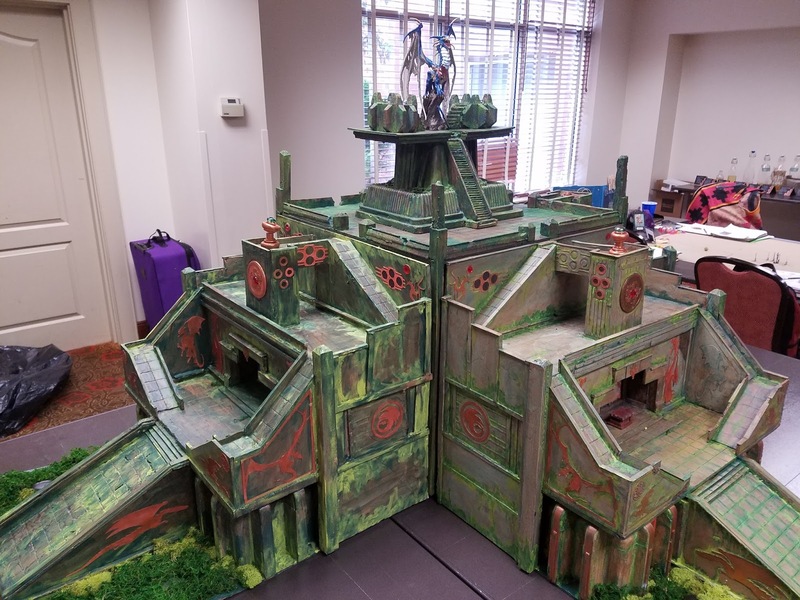 To facilitate this, we decided a piece of custom terrain was needed. My friend Ike Horton, and fellow DM Team member, volunteered for the task. For background Ike is the person who introduced me to the Dungeons and Dragons game all the way back in 1983. He is also a very talented paper craft artist so it was no surprise the Great Ziggurat would be a visual feast when completed. Ike shared various progress pictures along the way to the DM Team, but nothing compared to when it was finally revealed. 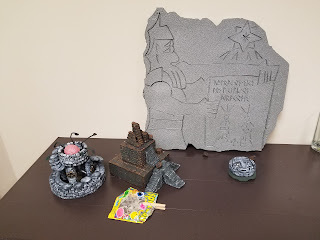 As you can see from the pictures below, Ike made a monstrous piece of terrain. The entire ziggurat is scratch built and measures an eye popping 7’ long, 5’ high, and 3’ wide! 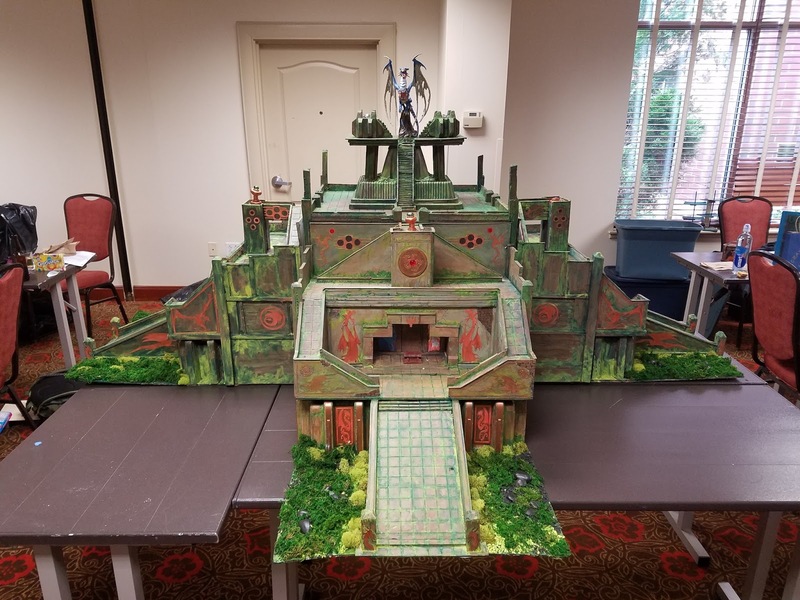 We had to use four tables in the hotel just to set the ziggurat up before the big reveal to the players. One fantastic part of the design is all three sides separate from the main ziggurat. This way each of our three tables had a piece as the different groups battled their way to the top. Here you can see how the sides connected. Another view of the sides. A close-up of a Tiamat sigil & caustic water spouts. Nethyrmaul waiting for a PC to snack on. 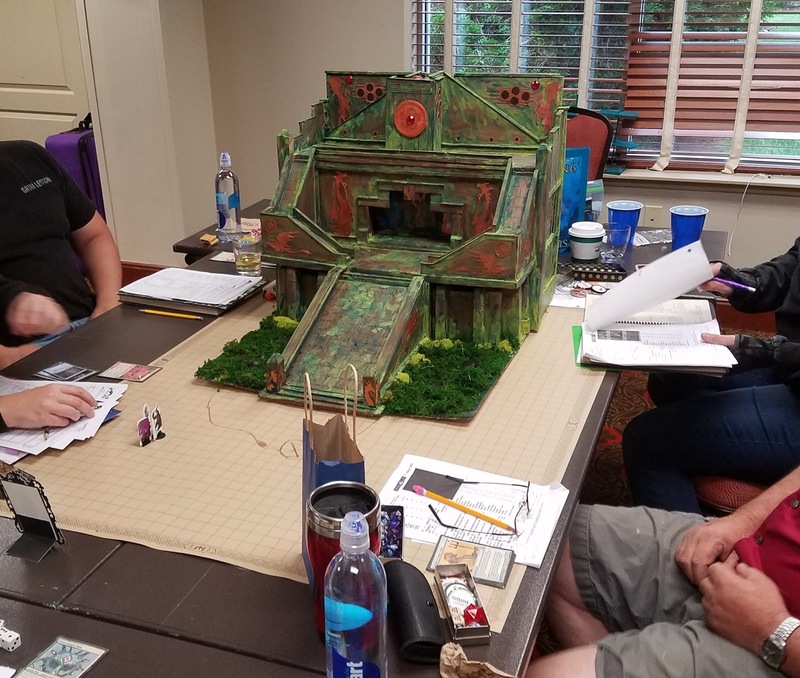 Example of a detached side at the game table. 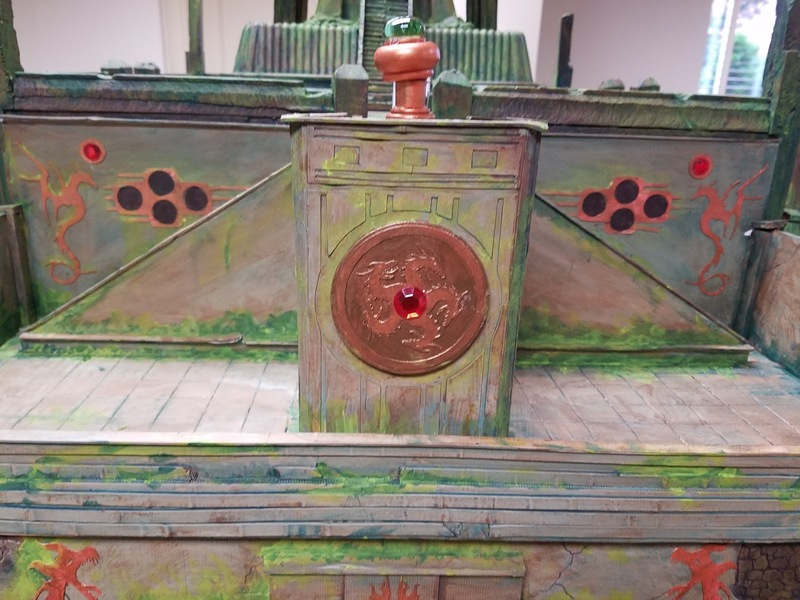 I just want to commend Ike again on his amazing work designing such an unforgettable game prop. You can find Ike on Facebook here. 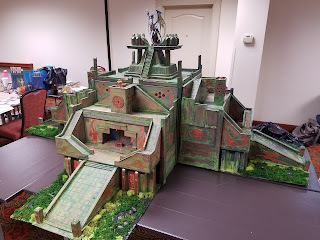 If you have a piece of papercraft art in mind, or maybe even some custom gaming terrain contact him. Ike has a busy schedule, and often multiple commissions, but I’m sure he would love to hear from you! We have already started working on Ultracon for next summer. If you have never tried, I highly recommend putting together a family and friends convention. It's very rewarding gathering together old friends and new for a weekend of gaming, camaraderie, and steel on steel! You would be surprised how many crafty people are in your circle, and all the amazing things you can create together. 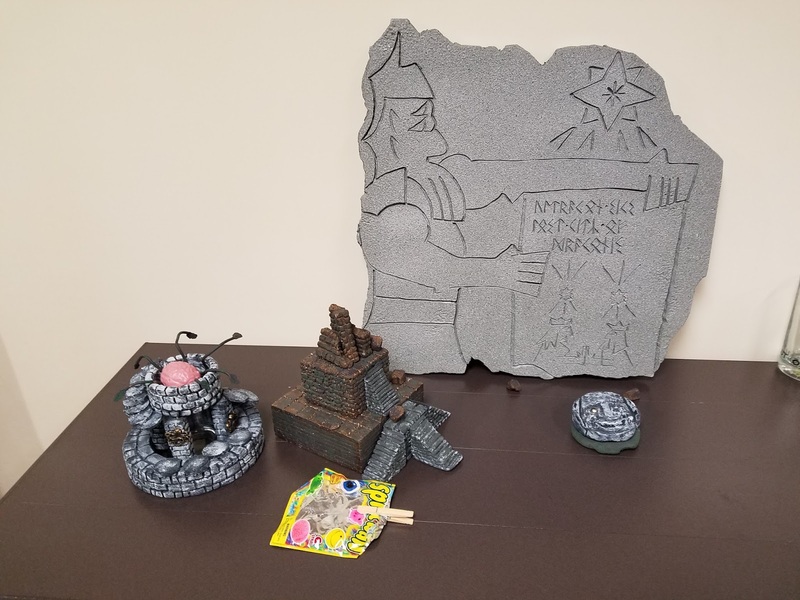 Custom terrain and props by another member of the DM Team.